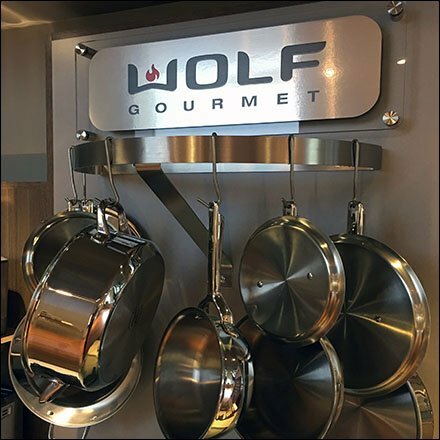 A bar merchandiser and hang rod display are the central focus here for Sub-Zero Showroom Wolf Gourmet Cookware. Stainless steel Wolf Gourmet branding tops the assemblage. A cross sell to cutlery (right) and countertop appliances (left) completes the presentation. Normally backstock might be stored below, but as a showroom, the purpose here is more to show off package design to visiting retailers. Seen at the Sub-Zero / Wolf Showroom in Pine Brook, New Jersey.